Hey what's up everyone? Chandler here with a very surprising post. Due to some issues popping up, and the world aligning with the right stars, I am NOVA BOUND. This is super exciting for me, and I can't wait to do this, because it will probably be the last tournament I will be able to attend until after January. I can't wait because this list is a Throw Back list to my old 5th edition list. It is something I put together because these are the Models I had, The Models I wanted, and I had about 4 hours to pull something out of my Hat. 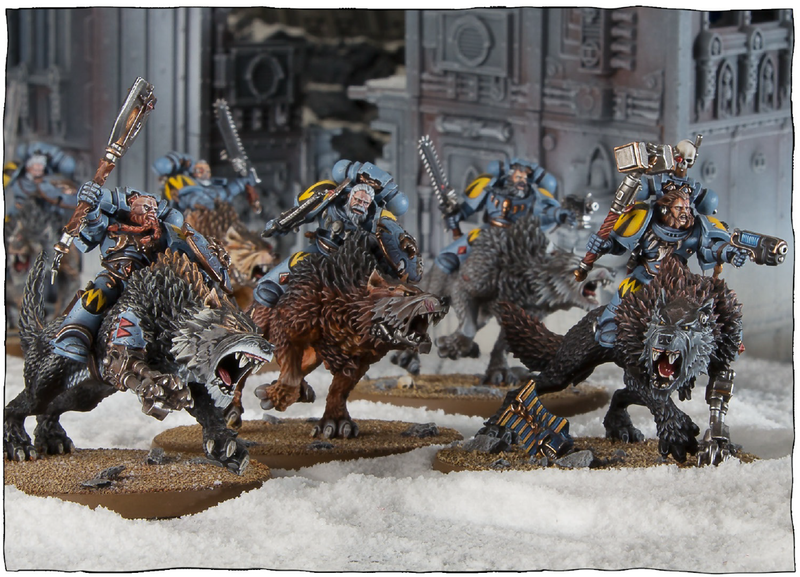 So: Chandler's NOVA Space Wolves. The Rest of the Blog is at NOVA! I'm in Charge! BeeCee here. Evan and Ron are at NOVA and Chandler is back to school teaching this week, that can only mean one thing! I'm in charge today! As you all may know, Facing the Grey Tide is a huge fan/supporter of Forge the Narrative. With that in mind, tonight we will pay homage to MBG to give him what he never gets on the FTN podcasts/webcast. OK, I promise there will be meaningful content tomorrow! Give 'em hell at NOVA boys! This should be my final update before NOVA (considering I'll be on the road in less than 24 hours). At this point I'm more or less hanging up my paint brushes and going with what I have. I didn't get to my display boards. I did, however, get in a practice game over the weekend and painted up one of my Malifaux crew. What's up everyone? Chandler here with another review, and this time, it is Chapter 666, The Grey Knights. This is a Codex surprise in a way. 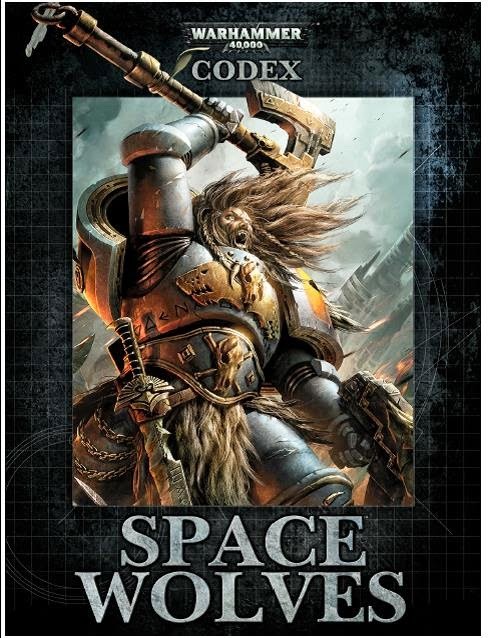 Only two weeks out from Codex: Space Wolves, and we have our next 7th edition book. This is awesome, and with the new dataslate out earlier today, the Knights are on the move, looking for Demons. 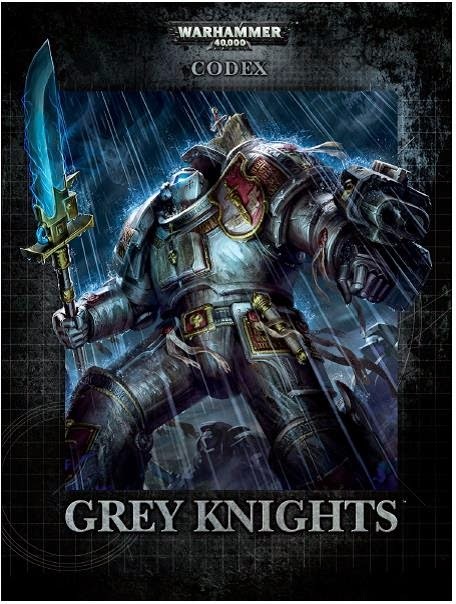 So without further interruption: I give you Codex: Grey Knights. Now that Assassins are no longer in the Grey Knights Codex (that review coming soon), they instead are included in their own dataslate, opening them up to be taken in just about any army. My newest article on Torrent of Fire is up for my fellow stats enthusiasts. I took a look at the first three months of data and what that could mean for the future of the Meta. 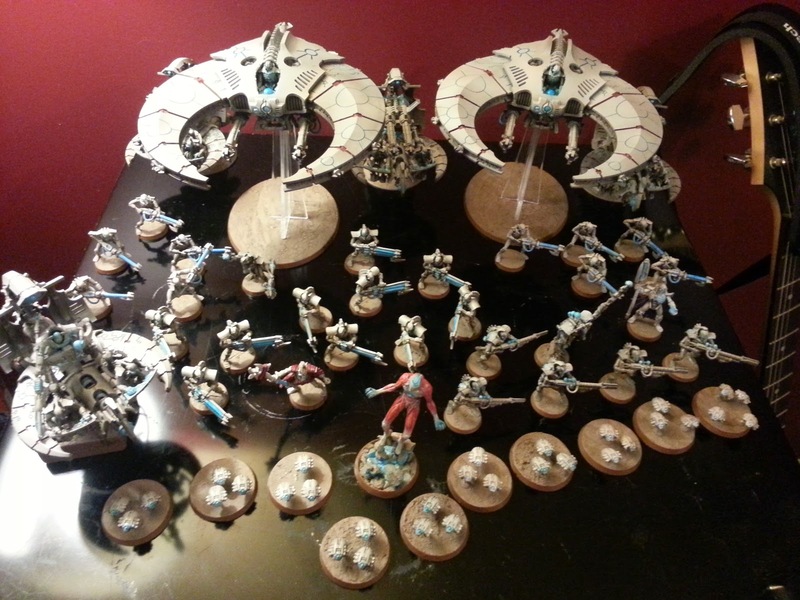 Eldar are still holding their own, and Space Marines are extremely popular. Check out the full article, and see if you agree with my bold predictions for the makeup of the top bracket at NOVA. 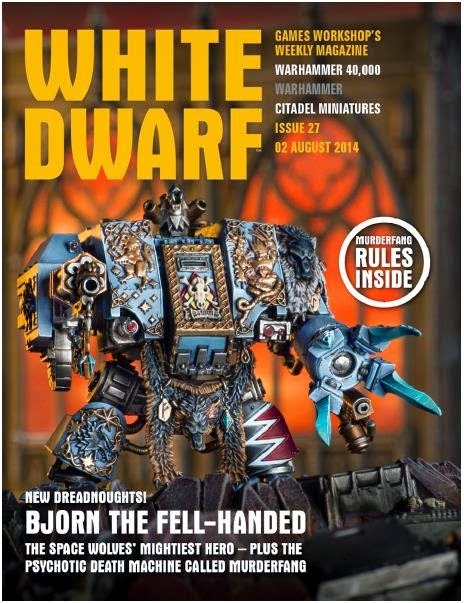 This week's White Dwarf has arrived, featuring the super awesome new Nagash min. This monster is no joke, and is just a gorgeous sculpt that will tempt many a collector (this one included). Get out the Waffle Iron: List Building for the Renegade Open. BeeCee here with another update. Soooooo...... Remember when I said I was for sure playing Skyblight at the Renegade Open. Welp, things changed! 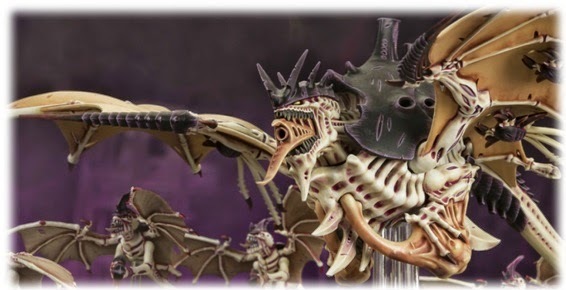 The good folks at Renegade posted their army list rules and they are allowing Forgeworld and limited Lords of War. As prep time winds down, I'm finding myself much more comfortable with where I am that I was last year. In fact, I'm done with both of my armies. As the newest contributor to the blog, I wanted to take a moment to introduce myself. I am the resident fantasy player of the group, yet to make the leap to 40k. I grew up playing both fantasy and 40k with Evan. After a long hiatus I have decided to make the leap back into the hobby. While I do enjoy the painting and fluff of the hobby, my real passion is the gaming side, so the fact that NOVA is fast approaching motivated me to get back into the swing of things. 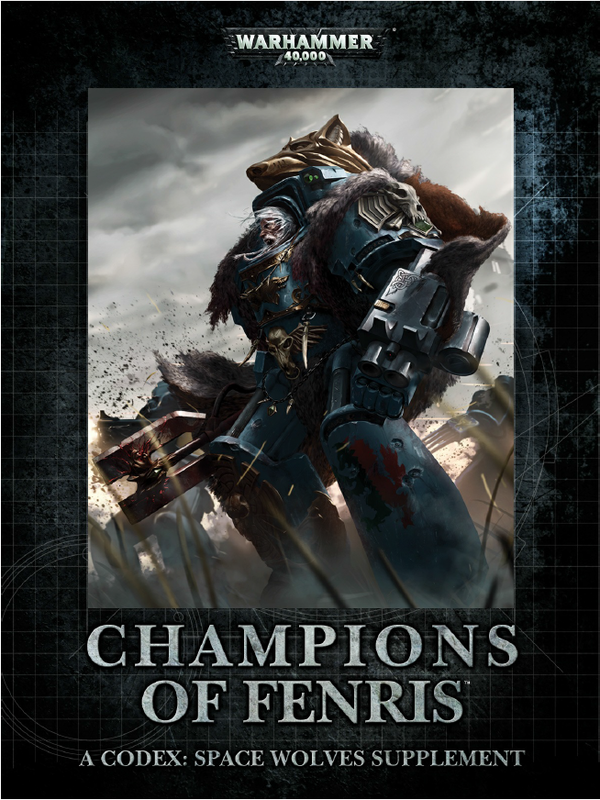 Last weekend saw the release of the Space Wolf Supplement - Champions of Fenris. Chandler will probably do a complete treatment of the book, including fluff and everything it entails. I'll just take a quick look at the new rules that come with the supplement. 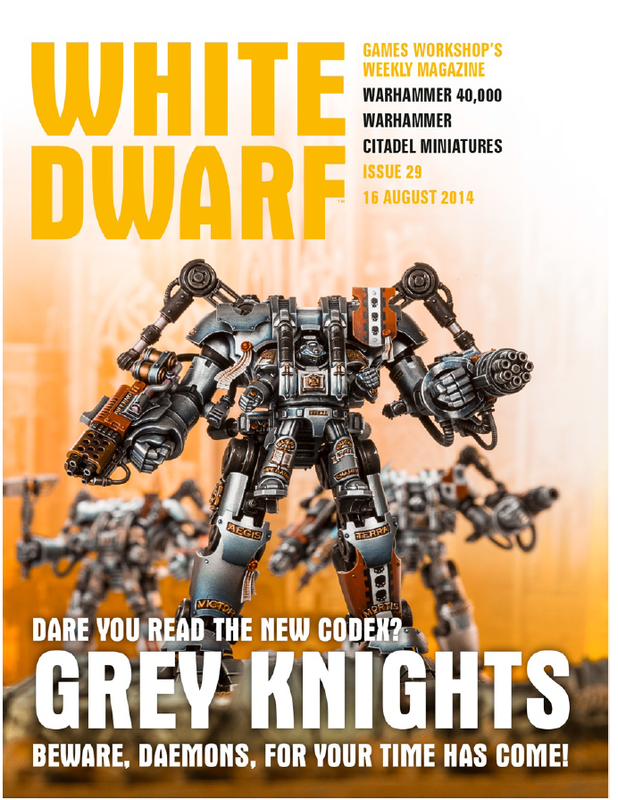 This week's White Dwarf has arrived, and it features the somewhat surprise codex release of Grey Knights. For August at least, Games Workshop is ramping up the already frantic rules release schedule, giving us a second codex this month. In the teaser blurb, it is hinted that the mysterious past of the Grey Knights will be at least partially revealed as tying back to their founding during the Horus Heresy. The promise of possibly linking up with the Garro series has me at least intrigued from a fluff perspective. 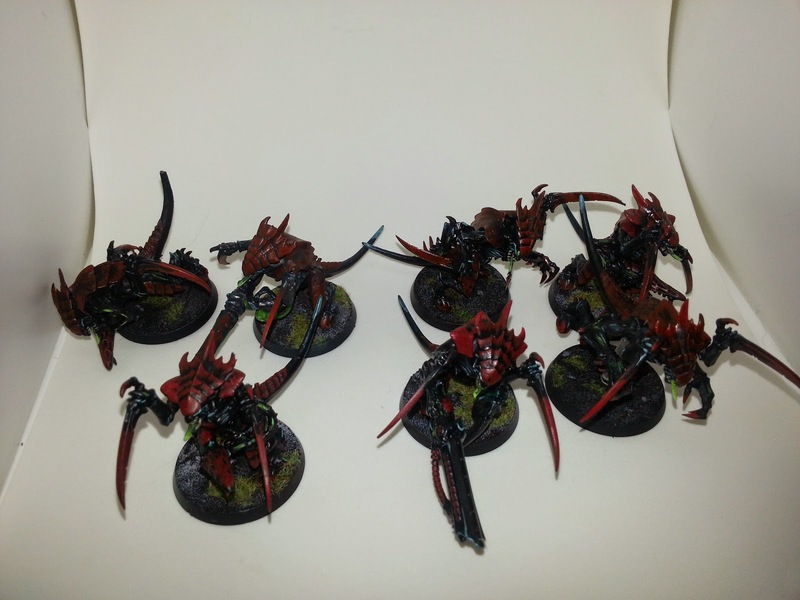 Skyblight Tyranids: Taking the Blog Back from the Wolves for a Day. BeeCee here with a quick update. As you can imagine, Wolf fury has gripped the blog in force. Not only are there some strong units in the codex, but also Chandler and Ron are Space Wolf players. Ron posted up his list and one of the things he mentioned is that it might struggle versus Skyblight. What a perfect time for me to post the Skyblight list I am working on for the Renegade Open in November. What's up everyone? This week on the Podcast, we continue the chase of the Wolves. We start the show by finding out what the guys have been up to for the last couple of weeks, we chase down the Warlord Traits (Sagas) and Tempestas Discipline (Space Wolf psychic powers) before finishing off the show with the big tournament at the end of August, NOVA 2014 in Arlington, VA (August 28th-31st). The boys go through a hefty mission pack that you need to play test before you get to NOVA (friendly advice). The Wolves are unleashed, and so are the Boys as they take on this weeks Tide of Information. Ron here with a first draft Thunderwolf spam list. Look away if you abhor processed cheese taken with processed meat (spam with cheese). Ron here with another Space Wolves codex review in the form of hot/cold units. While it's still too early to have unlocked the entire codex, we're starting to get a good idea of the winners/losers of this new book. 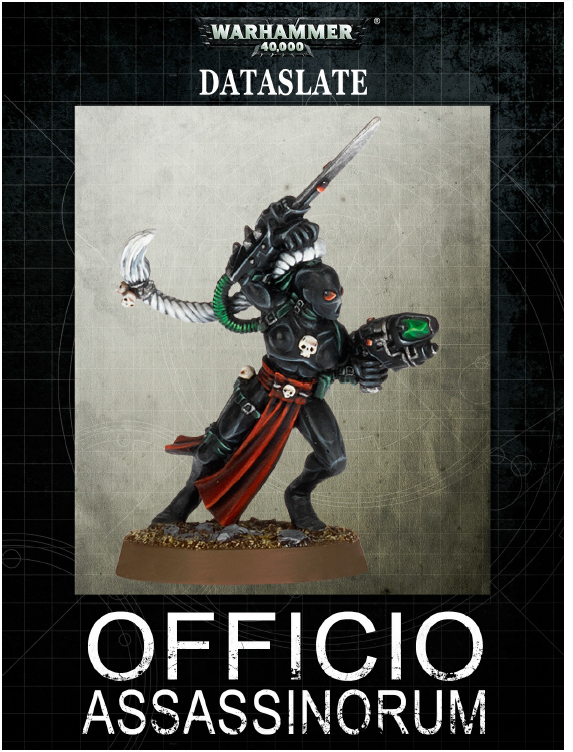 My main armies are Tyranids and Wolves, and I'm excited to play this codex. Sure there has been a lot of unique items/abilities removed from the codex, and no, the psychic powers/relics don't seem that great, but there are definitely some gems in the unit entries. So put on your swimming caps and speedos, it's time to dive in polar bear style. What's up everyone? 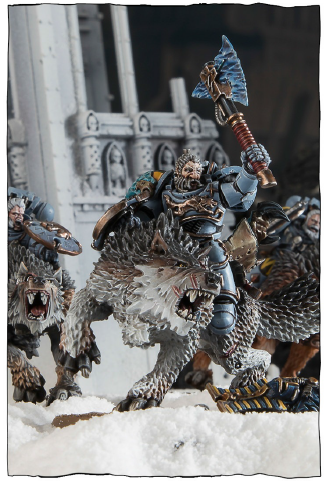 With the new Space Wolf Codex, I have been thinking about as many different lists as possible trying to figure out what style I like, what appeals to me, and what I want in my list. I love the fact there are options for every type of player, every type of style, and probably one of the more unique ally types. For me, this is all Wolves. I have put together a Wolves Unleashed Detachment. I will explain my reasoning, but this is a list that plays on the traditional army style of the Space Wolves. 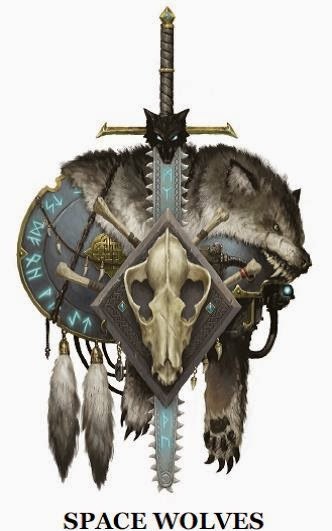 Winter has come early, and after spending several hours looking through the digital codex, the 5th Edition Codex, checking the Runes, listening to the winds, and determining my Wyrd; I am finally ready to bring about the most comprehensive Space Wolves review that I can do. This is going to be top down with no holding back. 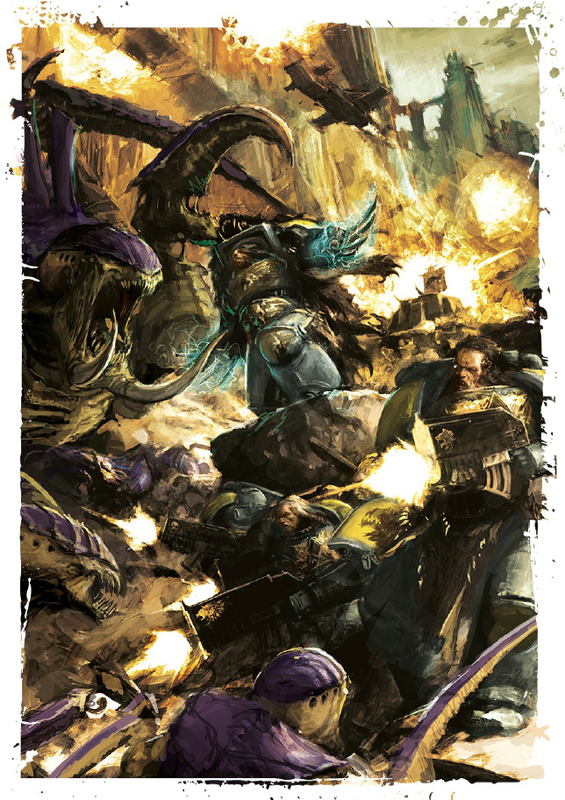 Before I continue, I would like to say that outside of some issues with trying to figure out what costs what, and what different units can take what; I have come to the conclusion that GW took away some of our flair unique to the Wolves, but gave us a codex inline with that of the Space Marines while still giving us the Wolves' flair we have come to expect. And now, we unleash the Rout. Chandler will be doing the Space Wolf Codex justice this weekend and going through it, but I thought I would share what I thought at first glance to be an insane and fun broken combo that came to mind, using the current NOVA army creation rules. The list hits hard and has a bit of a deathstar with Thunderwolf Cavalry, but I'm sure there are other ways to go about it. 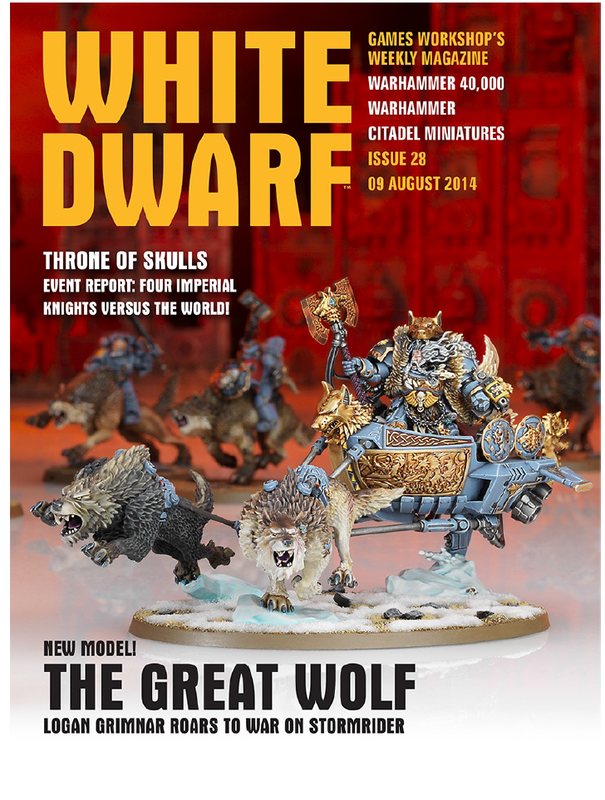 In addition to plenty of glamour shots of the head wolf on his pimp sled, he also is the focus of the Space Wolf Supplement, Champions of Fenris, which features additional equipment and seven formations, in the same style as Waaagh! Ghazghkull. 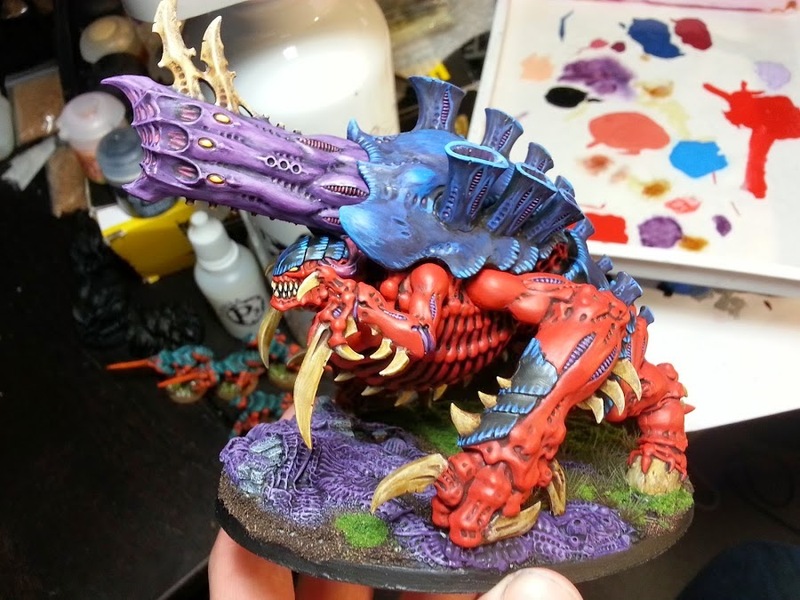 Ron here again with another underwhelming painting report. I've got 3 weeks on the nose to get everything in order. It's not going to be a pretty finish, but I'll limp across the line with a 3 color minimum model or two. This weekend I got a solid day of painting in, and knocked out the last of the Necrons for NOVA. 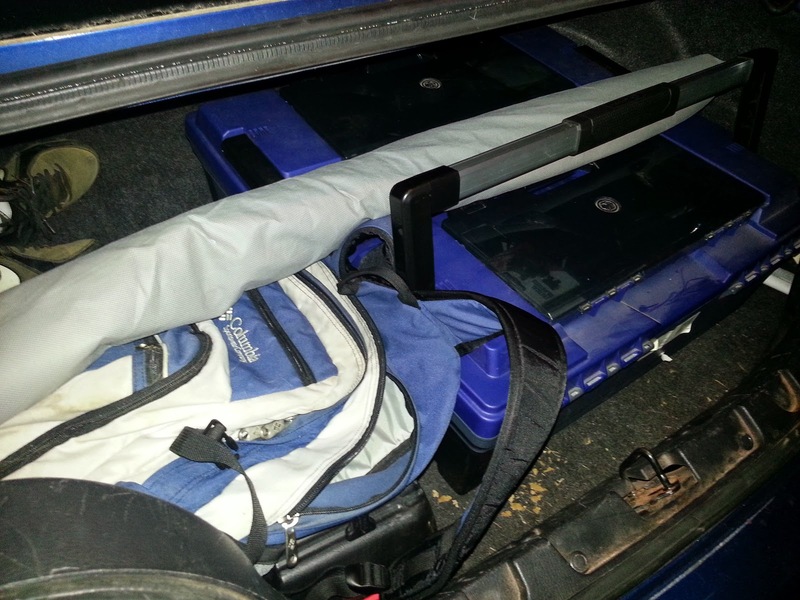 Conveniently, on Monday I also got my custom foam from Battlefoam to transport the army. And with that, I'm done on the Necron side of things. 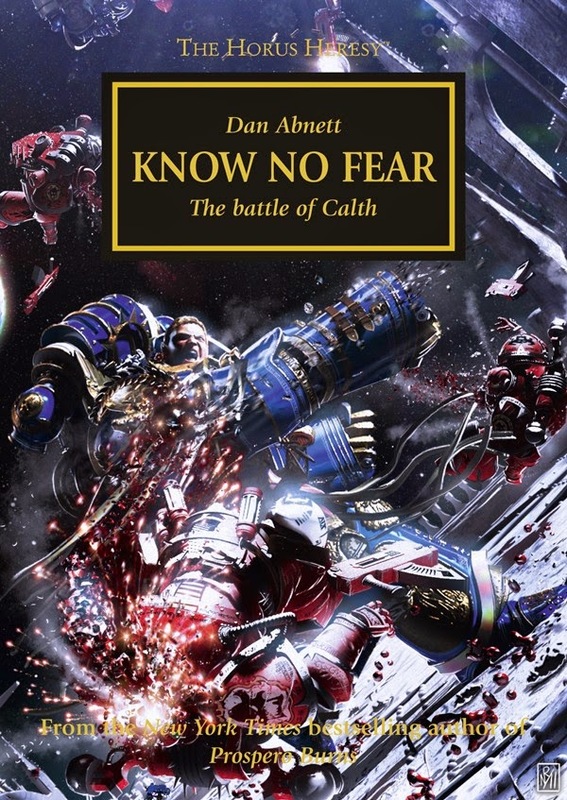 Next up in the Horus Heresy Review Series is Know No Fear, by Dan Abnett. As the subtitle suggests, this story centers around the battle of Calth, where the Ultramarines are attacked by the Word Bearers. As always, potential spoilers ahead. If I were to summarize the story, it would boil down to "don't piss off Ultramarines." There are plenty of badass moments for the Ultramarines, including Guilliman hanging out in space without a helmet for a while. What's up everyone? 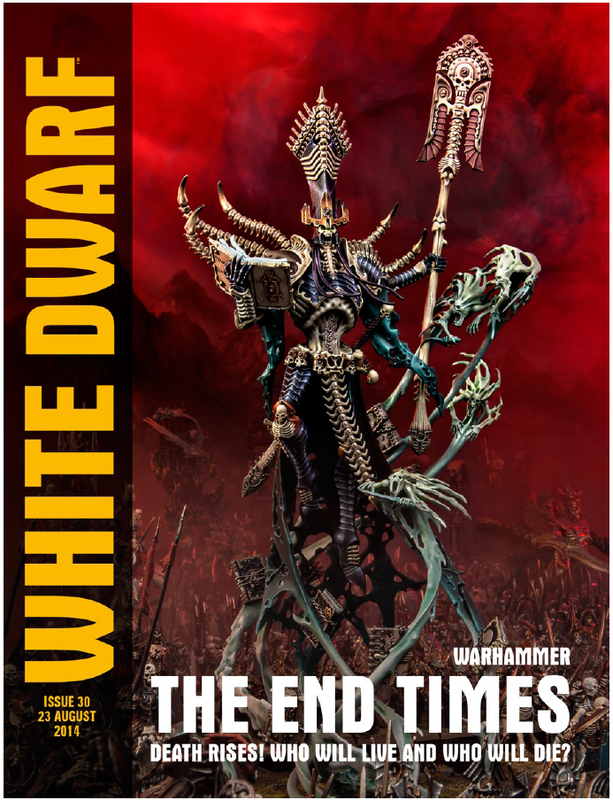 Another week, another White Dwarf, and the Wolves of Fenris are continuing to have more models, along with the first picture of the Codex. The Wolves are coming strong with new models, new rules, and three editions of the Codex. The Rout is getting closer to being released, and everything is looking amazing. My most recent Torrent of Fire article is up. 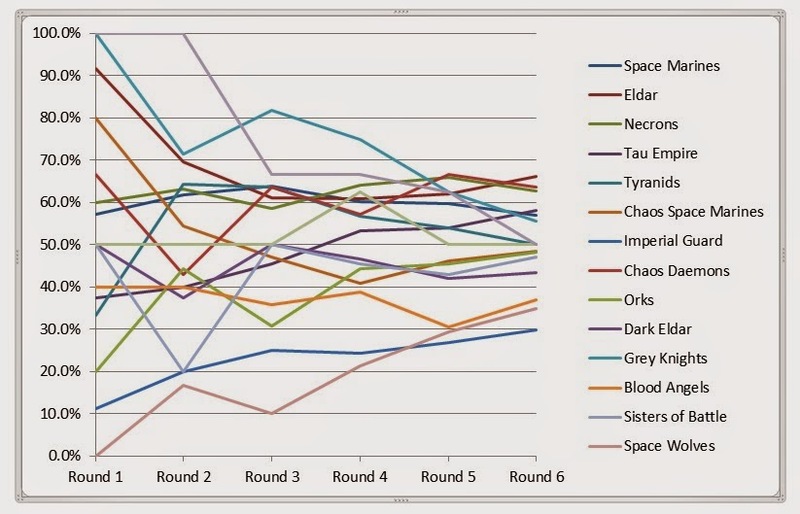 This time I took a look at the BAO results and what that could mean for the 7th Edition Tournament Meta going forward.